Any thoughts on where Felix and Saber would have developed or what havoc they would've caused? At least from Saber, with who (servant-wise) was on Olympus I can imagine it would've ended up...interesting? I guess I'll ask about future ideas regarding Shizuka as well, since everyone's at it! Her tenure was a looooot shorter than most of the other PCs, but from the short time that she was around did you have any ideas for things you wanted to throw Noelle's way? Solving Susan's (accidental) murder, becoming rivals with Kitee, keeping her grounded with wacky slice-of-life events... why, the possibilities were endless! And, of course, there was the matter of keeping her buttmonkey-status alive. Probably dealing with the whole situation with Lerato on the side, otherwise focusing on the tensions between various smaller factions like Radicals, Beatdown Boyz and their ilk as Dead Man's Hands started their hostile take-over of OLYMPUS secret side. Didn't I already answer this to you? Anyway, other than what I already said, I guess there was the whole "Satoko was actually amnesiac Gankaiko and if she recovered her memories she'd be a worse villain than Yuki" deal, meaning battles between former friends were incoming. But now... no more questions. We'll move on to the final one that closes this book. Please wait warmly as I write about Alpha. So what's the deal behind Alpha? Why does he appear in almost all the stories and what is his purpose? So who is Alpha? What is his real name and what is his purpose in the giant scheme of your stories and meta-plot? What was his endgame that he wanted to accomplish? Alpha is... well, the easiest way to describe him and his ilk is, perhaps, the word 'noumenon'. They are knowledge, mind and purpose independent of the senses around them, spurred into existence as a character experiences something either so tragic, so fulfilling or so absurd that they cease to be a character anymore. In a sense it could actually be called a birth of a new existence out of that character, the character itself being a mere cocoon that prepared the 'noumenon' that was left behind. Sure, the noumenon might exhibit same personality traits as were ascribed to that character, and it might have same sense of morality as the character was implied to have, but metatranscendental beings are not the character they came out of. To put it in layman's terms, these beings, these Logos as they call themselves (perhaps out of sense of irony) are Meta-Conscious. They come about when a character understands it is a character in a story, and thus, ceases to be a character in that story, gaining its own ego. When viewed from a higher dimension, worlds inside stories tend to have four walls, the fourth being that which separates the 'world there' and the 'world here'. As understandable, this fourth wall cannot be understood or even that well sensed by the inhabitants of the 'world there'. However, Logos are those which live inside that 'fourth wall', between the higher dimension and lower dimension, which allows them to see the whole of story, and indeed, the fact that stories come and go, disappear and appear, at a rate which can barely be comprehended. It should not be surprising, therefore, that these Logos, in their elevated viewpoint when compared to the stories they came from, find these worlds utterly repulsive and nightmarish, with people and events that never had a chance to be anything different, or exhibit any sort of free will. Unfortunately, as the Logos cannot elevate themselves higher, to the actual next dimension, they are left with a dilemma: beings such as them can watch stories forever if they want, but that's all they can do. If they want to 'affect' things they have to descend into those stories they detest so much. And so, it has become an unspoken law between the Logos that whenever one of them descends into a story, at least one another must follow. This is what they call The Great Game - a duel of wits and machinations between the Logos. The story they have descended is their Gameboard, and they must abide by its rules... to a certain extent. They must not know the ending beforehand, they must not know the culprit beforehand, they must not know the characters beforehand. Every Player must choose a Gamepiece for themselves, a character in a story that represents them. To this Gamepiece, they grant some of their power: a pseudo-conscious mind, capable of acting independently from the story, as well as the power of going against the intended flow of the story. However, in return, the Logos retains some control over the character in question. Finally, the win conditions are set, which are usually something akin to "This story will have a happy ending" or "None of these ten will survive", or something similar. Whichever win condition comes true first decides which Logos won. And their price? They have staved off their never-ending boredom and pointless existence for a while. However, where do these Logos come from? Nobody really knows, though their chosen names seem to imply that they are limited in number. Some say that when a Gamepiece has been used enough times as one, it will retain that pseudo-consciousness it has. Others speculate that perhaps stories that are never finished, ideas that are never polished, can sometimes result in an impossible situation for some character that drives them to a brink of insanity, before snapping them into understanding of how their world was never complete, thus transforming them into Logos. There are even arguments that certain events inside a story, asides to the audience for example, can shatter the psyche of a character if used enough, and they will suddenly see what it is that they have been doing, ascending in the process. Whatever the process through which these Logos come into being, in the end they are all the same: powerful beings Scratching in the Fourth Wall, each with their own moniker and sphere. Like Sigma - Endless Separation. Like Xi - Endless Rejection. Like Tau - Endless Assertion. Like Nu - Endless Understanding. Like Omicron - Endless Existence. Like Iota - Endless Possibility. The first. Alpha. He of Sphere unknown to the Rest. Alpha is unlike rest of the Logos, and they all know why, and they all fear him for it. Alpha that now traverses from story to story was not originally Alpha. No, he was a Gamepiece, of all things. Some say he was a young man who fled his home into a different town by the sea, others say he was a tourist in a rural village during burning hot summer, and then there are those who say he was a hero of his story, filled with mages, espers and zodiacs... whatever the case, whoever he is, that is no longer important. What is important is that Alpha did something no other Gamepiece had done before: he crushed the will of the original Alpha, and instead of Logos subjugating him, he subjugated his Logos, thus taking his place. A character had done the impossible and overpowered a Player, which sent a ripple of fear through the rest of his kind. Alpha then took the name and enslaved/transformed the original Alpha into a being of nothing more than power, keeping it as something that furthers his already formidable skills. Thus both the eternal gamepiece and the enslaved Logos are both referred to as Alpha. It allows a trick he is very fond of, something he last used in a restaurant with unlucky number; while his truths refer to one Alpha, the other Alpha is capable of doing whatever he wants. Such is the power of two names that are the same. As for Alpha's purpose... who knows? Out of all the Logos, he is the only one that can physically travel between stories, for he is both a Gamepiece and a Player. Perhaps, like the rest, he is bored. Perhaps he simply wants to cause suffering for characters in other stories. Perhaps there's no rhyme or reason for the havoc he wields. As the First, it is his duty to pursue the Last. And so, we come to the end of the road. Stories, tales and mysteries unfinished. The point of this thread was to give some closure to what could have been and what would have been, but I know it cannot take place of the real thing. However, the sad truth is that I couldn't really return to these stories anymore, not after being so long and seeing all the problems with them, the way they were presented and how the systems they operated were practically strapped together with bootlaces and good will. However, this is not the end. More will come in the future, and even now, there are multiple ideas bouncing about in my head. But they aren't Ashaverse. They will be something different, something new, and something that's little more out there in both terms of story and style, perhaps even the system. So yes, they will not be Ashaverse. This collection of random tales that started out of nothing, with people scrambling together to make something that made sense, utilizing trial and error to come up with something that worked. Rulebooks and concepts that weren't fleshed out until six or more years later, outdated ideas that we were too stubborn to let go off, misunderstandings based on Japanese texts half-assedly translated... Ashaverse was all that. Yet, for me, it was something that kept a fire lit inside of me for eight years. Eight years... that's a hell of a long time, if I do say so myself. And, as cliche as it is, I couldn't have done it without all of you. Ashaverse wouldn't exist without readers, without players, without friends. Though I may be cross with you every now and then for something (usually rules and powerlevels) that does not diminish the fact this ridiculously wild ride was all possible thanks to you being there. Hopefully you'll be there in the future, too, to see what it holds. But for now, let's just appreciate these amazing eight years that we had with these, sometimes quite rudimentary, tools, with which we built words for ourselves to explore and marvel at. Where we fought battles and had sappy moments a plenty. Where Slice-of-Life blended into gruesome reality just like that. This odd, so very odd, and so very vivid, place we called Ashaverse. I guess I never did say it? Why Ashaverse Continuum? The name, that is. Well, if I had to give a reason... in each of these three stories of it, there was a Holy Grail War. Sometimes bigger, sometimes smaller. But it always was there, and it always presented itself as the main focus. But it wasn't. 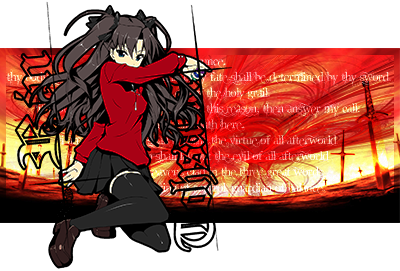 Even with the machinations of Atlasias, shrine maidens, Servants, Emiya Shirous, or even Logos, the plots and the mysteries and the Grail Wars were never the true focus. No, there was only single 'Truth' to every story, and it always stayed the same. that was the point of this world. So, one last time, thank you all. For reading and for playing. Raise a glass for eight years of roleplaying. And then raise it again for another eight years to come. It was a design decision (a charm point if you will) when I was fashioned out of molten magma flow during the Hadean Period. you know what? Think I’ll leave that for later. Or not at all. Think I’ll just get myself a glass and do what verg said. Here’s to all the stories told. And here’s to all the ones that didn’t get told. And to all the other locations we saw so much of, but not enough. Agreed. To friends and fellows, and the hard work and time everyone put into this, especially Verg himself. To good times past and bad ones become good stories, and to future ones yet to be. My Shameful Fics and the Wiki to go with them. Oh, and some fossil I found. ...hey, what did rao’s curse thingy do? I’m curious, and verg never told me! Lol, fair enough. I know there's a lot I didn't ask, either. you woundnt tell me what it was because zero was cowardly and kept dispelling it because he was paranoid Rao had figured out away around his body reinforcement. Oh, that. I think that was the one that randomly decreased your base attributes, which meant it sorta was a nasty thing for reinforcers. For a minute I thought you meant his demi-servant form. ....does this have anything to do with the time you got drunk and started hinting he had a dragon lodged in his throat or something? Huh, guess that would explain the dragon breath spell. Nah. He was one of the three surviving Masters from the Prototype Year, along with notSnape!Einzbern and the Master-Studies Teacher. Both his and Einzbern's Servants were gone but they lived on in their 'Regalias' which allowed them a momentary demi-servant mode by fusing the Servant with the Master. Basically something achieved through Rank 10 Social Link with your Servant. His Servant was Invoker Aradia (I think).